Since the post World War Two boom in private automobile ownership, Drive Tourism has transformed the tourism landscape by facilitating dispersal and the growth of attractions and tourism related infrastructure beyond the zones that had previously emerged around seaports and railway terminals. The automobile has made regional dispersal possible and created opportunities for many small rural communities to supplement rural economies with a tourism economy. Drive Tourism is a popular form of tourism activity that has significantly contributed to the development of Tourism in many nations, but has received relatively little attention in the literature. This book is the first attempt to provide a global comprehensive review and scholarly investigation into this popular and growing form of tourism. 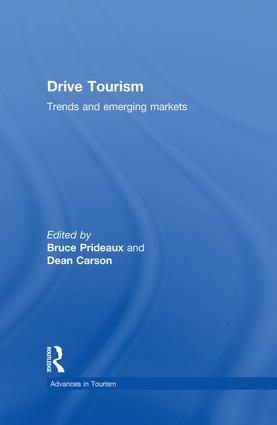 It draws on a vast range of geographical locations to critically explore the impacts of drive tourism in developed and underdeveloped regions. It evaluates tourism authorities’ response to the Drive Tourism Experience, and offers operational insights into the management of the drive experience as well as providing original empirical research and insights into the field that will contribute to future investigation. In doing so it explores the many forms of drive tourism from caravanning to fly drive touring. Four-wheel-drive tourism in desert Australia: The charge of the ‘might brigade’?